In a spectre of rallying that tests one's patience and rigour in equal measure, any amount of lead can forge the way for a sizeable advantage. 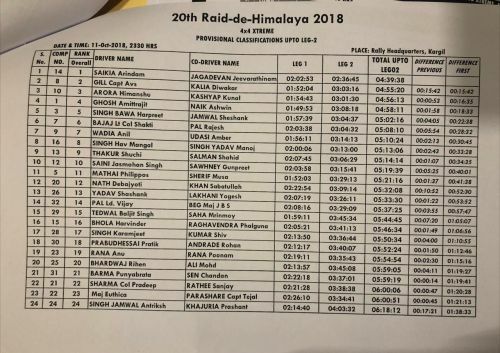 Against that narrative, as Arindam Saikia, co-driven by Jeeva J clinched a whopping 25-minute lead in the 4*4 category, Day 2 of Raid De Himalaya was set on fire. While the rest of the pack was putting on a show, in a format where a consistent demonstration of grit, pace call keeps a team in good stead, Saikia upped the ante in the contest, courtesy what clearly seems, a promising lead. But there was no dearth of developments further across the segment. On Day 2, during the Second leg, Stage 1 was run between Panikher to Panzila pass, a total distance of 75 kilometres. Having said that, Stage 2 spread across 66 km, was run between Panzila pass to Parkachik. What made these stages interesting was the additional threat added by inclement weather enforcing new challenges, with the phenomenon of snowfall, the presence of ice in certain sections, coupled with the mercury falling below 0 adding more weight to the immensity of the challenge that is Raid De Himalaya. To be precise, the run to the Panzila Pass made the contestants endure a temperature of around -7C at 15,500 feet. The unruly weather caused the officials to take a decision and cut down the stage distance for motorcycles. This was in lieu of the dangers imposed by the factor of ice; that wasn't going to retreat anytime soon, therefore adding more to the challenge for the motorcyclists, in particular. The stage finish for the extreme moto/quad was at Rangdum, which was around 42.5 km from Panikher. TVS Racing's R Natraj continued to extend his lead while his teammate Imran Pasha moved to second, ahead of SD Vishwas. That said, Saikia, who's in a Polaris XP 1000 also endured some braking issues right from the start of Day 1. Meanwhile, Capt. AVS Gill, in a Suzuki Grand Vitara, Himanshu Arora of Team Harjee Rallying, in a Suzuki Gypsy furthered the ante of their run. Rally-leader on Day 1, Team Mahindra Adventure's Amittrajit Ghosh, co-driven by Ashwin Naik dropped down to fourth overall, while his teammate, Phillippos Matthai had to face a double puncture during Stage 3. In addition to these troubles, he also had to endure a broken suspension component during Stage 4. Therefore, he ended up losing close to 30 mins, a precious span of time in a contest as arduous as Raid De Himalaya. Day 3, where the stage was to run from Drass and Sankhoo was called off due to safety reasons. And it will now feature only one stage, that shall comprise the run between Sankhoo and Drass, that will pass through the mountainous ranges and passes of Umba La and Sana La. TVS Riders, Asif Ali and Shamim Khan on their scooters are currently running in second and third place, respectively. 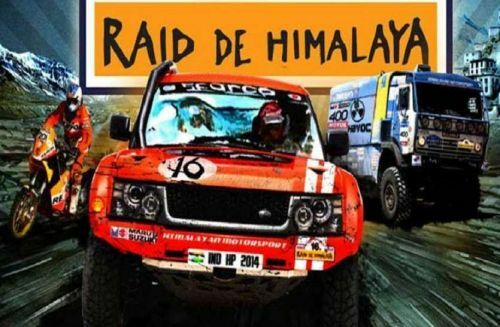 Thus far, Raid De Himalaya has already witnessed some thrilling turnstiles, made only more testing and unpredictable by the unforeseen situations added by precarious weather. It's not that hard to see why this Rally is so highly regarded in the annals of motor-sports.